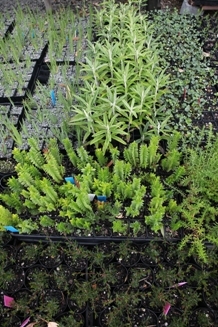 As with most nurseries, our plants are potted in well drained potting mixes and require regular watering until planted. In warmer weather this means watering every day or second day, with enough water to soak the entire root-ball. Check the top centimetre with your finger, if in doubt. Tease out roots gently, but only on plants with a tight root-ball (Do not disturb more than 10% of the roots). Mound up beds slightly if there is a danger of water-logging (or plant water-loving species). In dry or sandy soils it is preferable to plant in a slight dip, about the size of a saucer is usually sufficient. In most cases, the better the soil is prepared, the better the plants will fare. Indigenous plants are generally adapted to low nutrient soils with a low phosphorus content. After a dash of nutrient to get them off and running when planting, most require no further fertilizing. If you wish to use fertiliser, use a dash of native Osmocote under the mulch or in the soil around the plant, a skerrick of blood 'n bone, or a whisker (like a handful or two) of well rotted manure (not chook), or even a handfullor two of OR90, or worm castings. With any of these, mix well in the soil just around the plant when planting. Note: if using our potting mix to mix in with the soil, it’s already fertilized, so you will not require extra nutrients. Once the plant is in the ground, it will take a while for the roots to grow out from their pot shaped root-ball, so for the first 4 - 6 weeks water just enough to keep the root-ball moist: usually twice a week - more often in warm windy weather, less in cool times. (Note: Frequency of watering also depends on how big the plant is in the pot at time of planting). Once established, a plant well chosen for the site, may never need watering again, or just every two to four weeks in a particularly dry spell. When watering established plants, give a good deep soak infrequently, say once a month, rather than short frequent sprinkles. Of course if you get a good rain during that month, forget the watering. Many of our Tasmanian plants are well suited to growing in containers. Some in fact are more reliable in pots. (Check the pot suitability ratings after each plant in the plant lists). We have potting mix for sale ($6.50 for 20 litres), which is ideal for this use. When potting into larger pots you can mix in some of your best, well broken down compost - say 20% - or mix in a dash of good friable garden loam - no more than 10%. If a plant is not being potted on every 6 - 12 months, you will need to add nutrients - native osmocote is good (just under the surface) or dilute liquid feeds of aquasol or maxicrop every month or so. Alternatively, some other slow release, organic fertilizer as a mulch, would be suitable. A much neglected custom. Regular trimming results in a bushy plant. Just after flowering is recommended. Please ask if you are unsure how or when.